On Day 11 our friends at be quiet! have supplied an array of hardware. First prize is a Dark Base Pro 900 Silver rev. 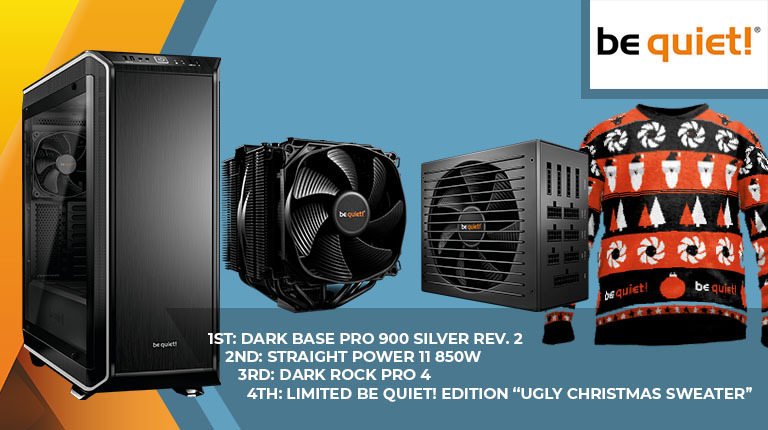 2 chassis, second prize is a Straight Power 11 850W power supply, and third prize is a Dark Rock Pro 4 CPU cooler. Seeing as it's the holiday season, we also have a limited edition be quiet! "Ugly Christmas Sweater!" for the fourth name out of the hat! The competition winner will be picked at random from all eligible entries that arrive by 09:00 London time on the closing date, December 27, 2018. First prize is a a Dark Base Pro 900 Silver rev. 2 chassis. Second prize is a a Straight Power 11 850W power supply. Third prize is a a Dark Rock Pro 4 CPU cooler. Fourth prize is a limited edition be quiet! "Ugly Christmas Sweater."